Offering your customers the convenience of online payments equals faster payments and great customer service. Add a convenience fee to reduce the cost of merchant processing. Allow self serve phone payments for those customers who don’t have access to technology or are not tech savvy. Take simple premium payments via IVR and free up your customer service representatives to answer important inquiries. Make it easy and convenient for you and your customers with recurring payment schedules. Flexible scheduling by months, weeks, or even days. Take all major card brands including American Express and accept ACH or eCheck and provide payment flexibility to your customers. PDCflow is PCI-DSS Level 1 Compliant using Secure Entry Overlay in order to keep your customer’s payment data and your business safe. Give your customers the ability to make payments, review an invoice, and even sign a payment agreement anytime & anywhere. Email or text an eBill or policy to your customer and request payment, no need to redirect to an online payment center, making it simple to click and pay. Obtain a legal wet signature on any document and collect the payment in one fast communication with your customer. Reduce your costs with card present transactions while offering your customers a secure, PCI Compliant card payment option. Send the payment information to your customer for easy one click payment processing and attach the invoice as a pdf for review. Make it easy for your clients to make payments to your office with Online Payments, IVR Payment Processing, and Recurring Payment Schedules. Send a document, get a wet signature, and a payment all in one easy transaction within minutes. Request a Credit Card or ACH payment or request picture ID with a Signed Document. 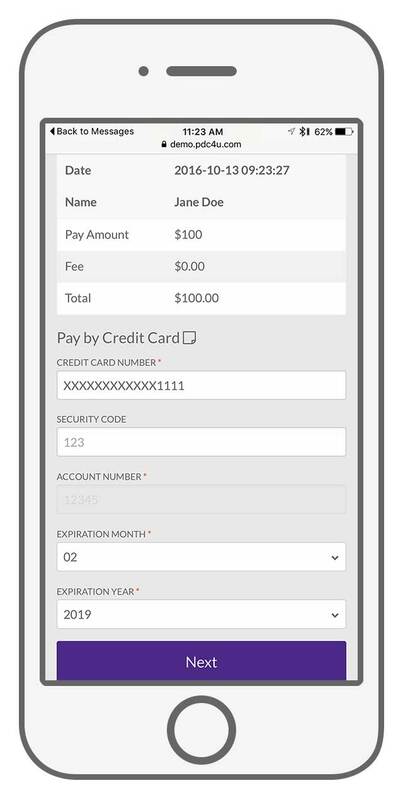 With customizable templates you can set up any type of request or payment flow. PDCflow offers a flexible fee structure so you can collect convenience fees on the transactions of your choice. Pull reports by Payment Type or Origin, segment by cashier, department or location. Quickly see what payment option is bringing in the best cash flow. Need Payments Integrated with your Accounts Managment Software?